When Angel Face was a kid Teacher and I took her to see one of her favorite authors, Kate DiCamillo. I’d never met a “real live” author so I was as excited as Angel Face was. During the presentation Ms. DiCamillo talked about her newest book, The Tale of Desperaux, some of her other books, her writing habits, and lots of other things I don’t remember. Afterwards she signed books, both those purchased on-site and those brought from home. There was a super-long line, but I knew there was no way we were going home without a signature. Angel Face couldn’t find her copy of Because of Winn Dixie so she brought the dust jacket for Ms DiCamillo to sign. Ms. DiCamillo found it amusing and wrote “Where’s the book?” above her signature. Angel Face has treasured that dust jacket ever since – she even wrote about it recently in one of her college papers! 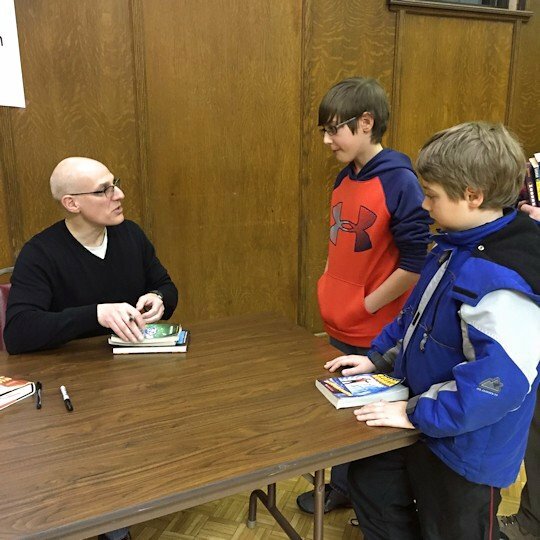 That day made such an impact on Angel Face that when Teacher found out that author Gordon Korman would be in the area I knew right away that we had to take the boys to see him. 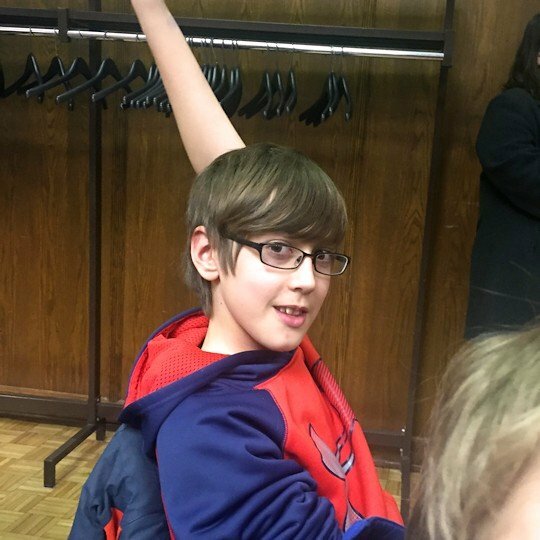 Z-Man had just finished The Hypnotists and couldn’t wait to get his hands on Memory Maze – the next book in the series – but he was a little shy about going to see the author in person. iMatt the child formerly known as Little Guy hadn’t read any of Mr. Korman’s books and was rather annoyed to be going somewhere in the evening. Heaven forbid he miss any of his limited TV time! But I knew they’d like it once they were there so we ignored their complaints and made them go anyway. And I was right. As usual. 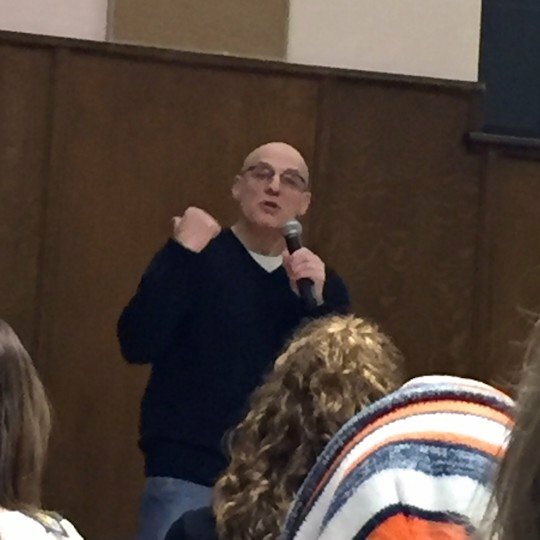 Mr. Korman began with an entertaining story about how he got started writing books. I was shocked to discover that he wrote his first book in 7th grade, and the book was published when he was in high school! I thought it was a great story for the boys to hear since he wasn’t much older than they are now. See boys, amazing things happen when you work hard on something! He talked about many of his books, and every time one Z-Man had read was mentioned he turned to me with a huge grin. At one point iMatt couldn’t resist The Hypnotists and started reading it, but I stopped him. I rarely discourage my kids from reading, but who knows when he’ll get another opportunity to listen to an author talk about his books? 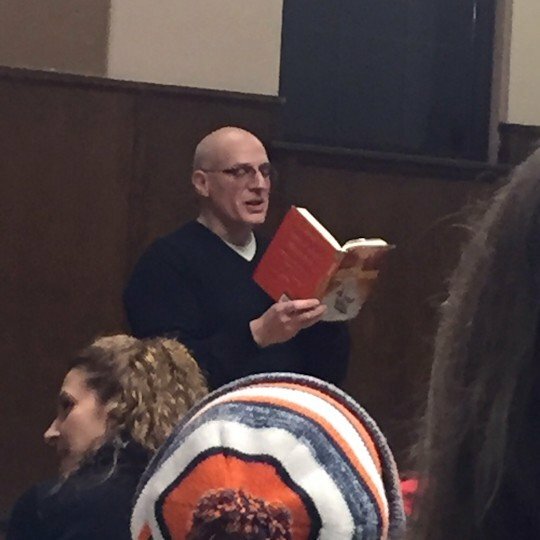 Mr. Korman ended his presentation by reading an excerpt from his newest book, Masterminds. It was so interesting that when he stopped I wanted to see what happened next, and plan to read it as soon as I can steal it from Z-Man Z-Man is done with it. In the meantime I read The Hypnotists and can’t wait to have time to read Memory Maze to find out what happens next. Z-Man’s hand was one of the first to go up when Mr. Korman asked if anyone had questions. 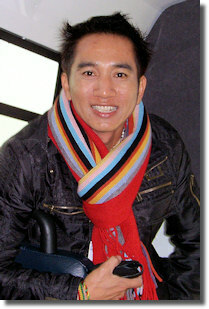 He waited patiently – even when iMatt put his hand up and was called on right away – and eventually was able to ask his question. Yes, I know he desperately needs a haircut. It’s on our To Do list for this weekend. After the presentation Mr. Korman signed books, and since it was a smaller venue with fewer people than we experienced with Kate DiCamillo we didn’t have to wait very long. 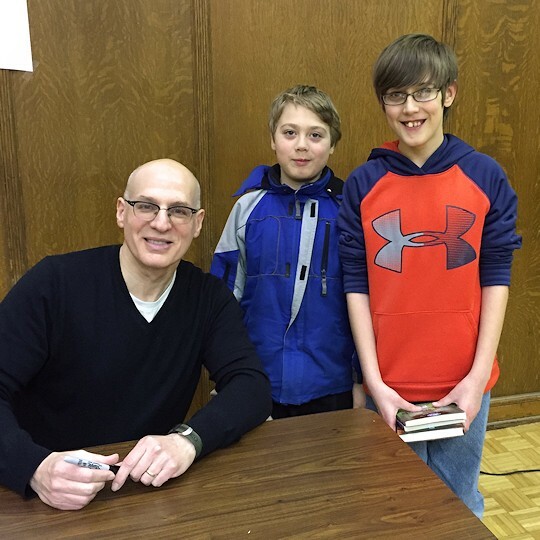 Both boys were a little shy, but thrilled to meet a “real live” author. 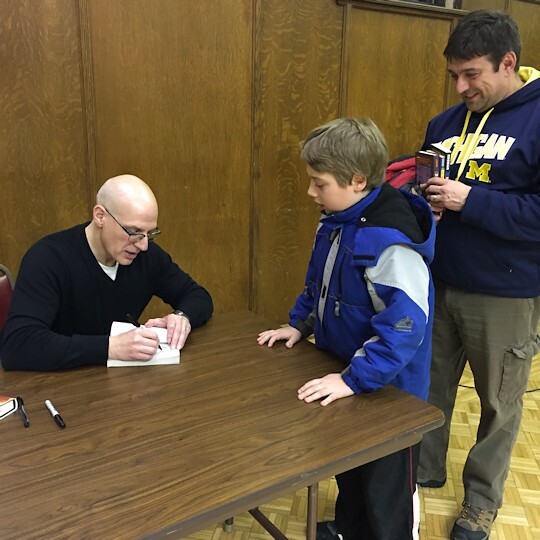 Z-Man was so shy he declined to have Mr. Korman sign a book to him, but after a little encouragement prodding from Mom he gave in. I think he was glad he gave in – he beams every time he looks at his name in the book. They each brought several books to be signed – some from our library and some from Teacher’s classroom. 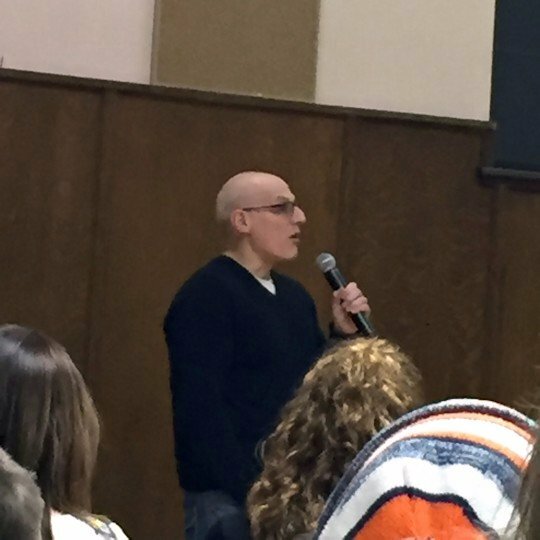 When I asked iMatt if he had anything to say about the Gordon Korman visit he said “I hope I get a chance to meet another author someday.” Not bad for a kid who didn’t want to give up watching Phineas and Ferb for the gazillionth time. Teacher had Mr. Korman sign a couple of books to his co-teacher and to himself. He was looking forward to telling his students about the experience, so I took a couple of photos for him to show his students. 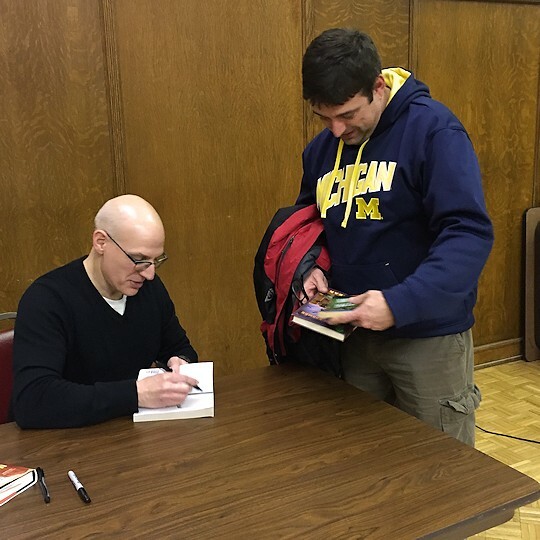 Mr. Korman was very gracious the whole time, taking time to speak with everyone and pose for photos. Lots and lots of photos. 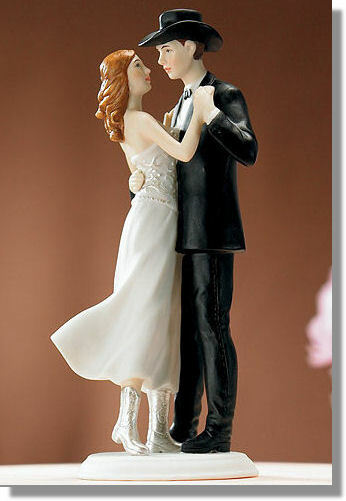 He moved things along without making us feel rushed or slighted. On the way home I had to tell the boys to close their books because there wasn’t enough light to read in. I asked them what they thought of the night, and what their favorite part was. They agreed it was “Really cool!” Z-Man’s favorite part was when Mr. Korman read from Masterminds, and iMatt’s was when Mr. Korman answered his question. I hope we get a chance to see another “real live” author soon, and that this visit inspires the boys’ Summer Journal writing. Maybe I can convince them to try writing a book! 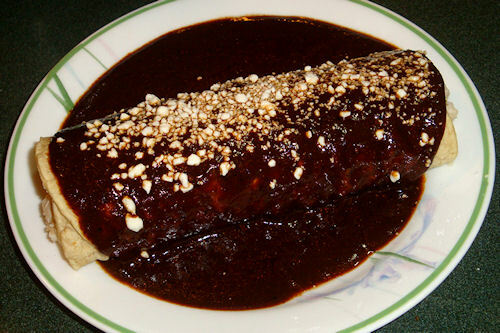 Holy Mexican Mole Sauce Batman!